Can’t make it to the Coors Light Watch Party? Check out one our Official Empire Bars across the city. Each location will feature the game and has amazing food and drink specials. 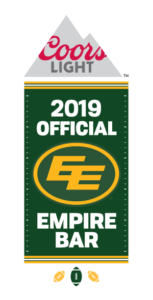 Look below for a location near you.There’s always a great way to watch Eskimos action!! !